The Chancel Choir will present the moving and reflective Choral Meditation A Service of Darkness by Dale Wood. This work is based on the seven last words of Christ and is an adaptation of the ancient Tenebrae service. The word Tenebrae comes from the Latin meaning “darkness”. 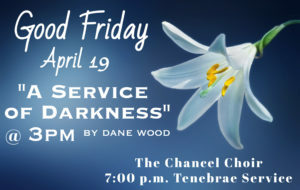 The Tenebrae is an ancient Christian Good Friday service that makes use of gradually diminishing light through the extinguishing of candles to symbolize the events of that week from the triumphant Palm Sunday entry through Jesus’ burial. This increasing darkness symbolizes the approaching darkness of Jesus’ death and of hopelessness in the world without God. The service concludes in darkness, sometimes with a final candle, the Christ candle, carried out of the sanctuary symbolizing the death of Jesus. The worshippers then leave in silence to ponder the impact of Christ’s death and await the coming Resurrection. The service will feature prayers and congregational hymns. Please join us as we reflect on Christ’s crucifixion on our journey toward Easter.